The Macallan have released a new range, the 1824 Series. the 1824 Series comprises of four “expressions” that do not have age statements and instead are named after the colour of the whisky: Gold, Amber, Sienna and Ruby. The idea is that the whisky progressively gets darker and is said to comprise of a blend of older whiskies. Nose: Vegetal with notes of yeast extract (Marmight, Vegemite etc) and cereal shimmering within bruised apples and ripe pears dusted with brown sugar. The mood of this whisky is dark with beams of light occasionally shining through – nutmeg and spicy burnt toffee develop with earthy Swiss mushrooms as sparks of peach and dried apricot illuminate the darkness. This is complex and entertaining, with an earthy – almost tequila – quality. Taste: On the palate this whisky turns into something very different. It is much sweeter than the nose suggests, radiating sugary candied plums and raisins with a dusting of cinnamon and dry green pear that develops into apricot. The balance seems skewed to the sweet side, with that earthiness coming through as the whisky rests on the tongue. Though, the dark chocolate begins to dry the mouth towards the end and into the finish. Finish: Mild and moderately dry finish with notes of wood and tart fruit peel, developing into orange rind and burnt praline notes radiating within the cocoa. 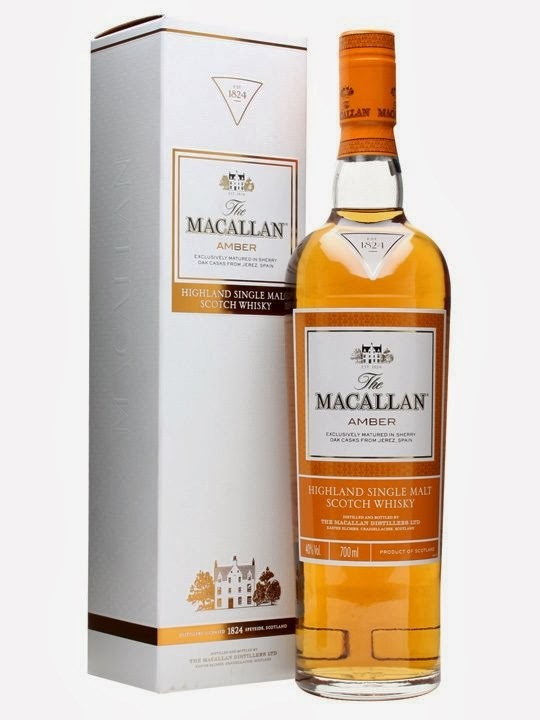 There are a few off notes lurking deep within this whisky, which seems imperfect when compared to the sensational Macallan Sienna and Ruby – the Amber is my least favourite of the 1824 series.